The site is offline, please see our list of recommended sites. Site is down, please see our recommended casinos. Jacks Vegas uses games powered by Play’n Go and casino enthusiasts can play both three and five reels slots and different types of table games, while casual players can try their luck in the scratch card games. Before they deposit money and play, players can check out the games in play-for-fun mode. Jacks Vegas is operated by Ever Support SA and owned by Ever Adventure Ltd and it has online gambling license granted by the jurisdiction in Gibraltar. The casino uses the latest security measures and it offers a number of banking methods. 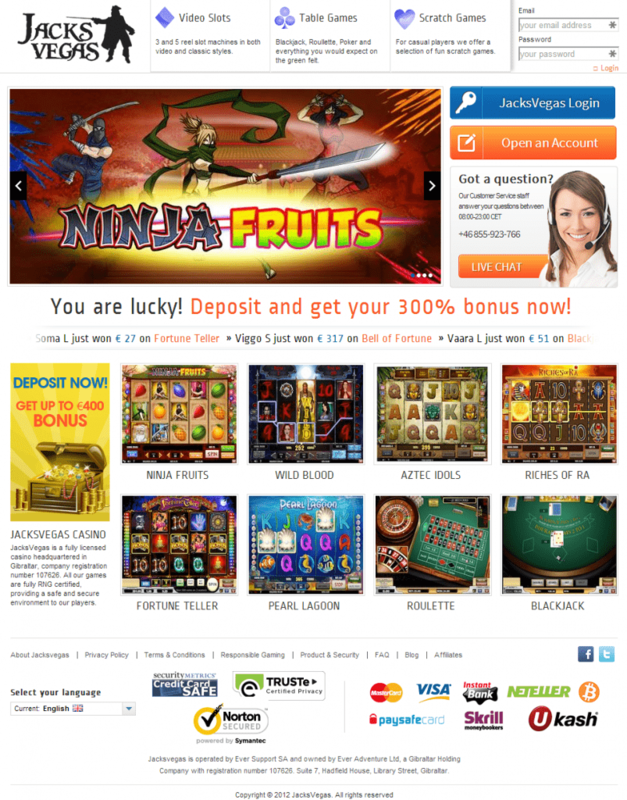 Jacks Vegas also has helpful and responsive player support available through live chat. To get started in Jacks Vegas, players need to open a real money online casino account with the casino. This means that you need to fill in a form requiring personal details like name and surname, e-mail address, password as well as birth date. Afterwards you are almost done so you need to choose a payment option. If you choose Bitcoin, you need to enter the amount you wish to deposit and it will be converted to Bitcoins. Then you need to send the amount of Bitcoins in the wallet address the casino will provide. The games are played directly from a web browser. Before you start playing for real money, you can check the games in free mode. Afterwards, when you feel confident, you can switch to real money play. The fans of the casual and fast games of luck can visit the scratch card section and see how lucky they are. There are not many scratch card games, but those on offer like Hole in One and Scratch Ahoy are fun to play. Not only it is available on desktop computers, but Jacks Vegas is also available on the go with their bitcoin compatible mobile casino. To access the games players need to enter the casino URL in the mobile browser, log in, make a deposit and start playing. Jacks Vegas Mobile is compatible with iOS Apple products like iPhones and iPads and it perfectly fits mobile device preferences. Moreover, in addition to thrilling casino games, players on the go can also take advantage of the 300% mobile casino bonus available to all new players. Jacks Vegas ensures that all games are fair and random and they all use Random Number Generator that randomly generates numbers. Therefore, the outcome of a game cannot be predicted or affected in any way. In other words, there is no manipulation and the games are not rigged. All games at Jacks Vegas are licensed in reputable jurisdictions such as Malta, UK and Alderney. Jacks Vegas also uses the same security measures used by many online banks. All information to and from the casino is encrypted using 256-bit SSL technology so nothing will leak onto the Internet. The casino also displays the TRUSTe seal, demonstrating commitment to customer privacy. Besides Bitcoins, players can also use Instant Bank, Ukash, Skrill, Visa, MasterCard, Neteller and other banking options to fund their casino accounts and withdraw their winnings. All these methods are fast, safe and reliable. However, with Bitcoins online banking is instant and anonymous. To start playing games for real money at Jacks Vegas, you only need a valid Bitcoin address. If they come across problems or have concerns, players at Jacks Vegas can contact the customer support staff through live chat feature on the website or they can call a representative via the provided phone number. The player support would be glad to help those in need. 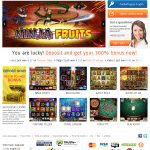 Jacks Vegas is safe online and mobile casino suitable for Bitcoin fans. It offers many thrilling games that are quite fun to play. Players can also choose from many different banking options and if they come across a problem they can easily reach the responsive player support.